Manuel Aristides Ramírez (born May 30, 1972 in Santo Domingo, Dominican Republic) is a Dominican-American former professional baseball outfielder. He played in Major League Baseball (MLB) for parts of 19 seasons. He played with the Cleveland Indians, Boston Red Sox, Los Angeles Dodgers, Chicago White Sox, and Tampa Bay Rays before playing one season in the Chinese Professional Baseball League. Ramirez is recognized for having had great batting skill and power. He was a nine-time Silver Slugger and was one of 25 players to hit 500 career home runs. His 21 grand slams are third all-time, and his 29 postseason home runs are the most in MLB history. He appeared in 12 All-Star Games, with a streak of eleven consecutive games beginning in 1998 that included every season that he played with the Red Sox. In 1985, he joined his father and mother who relocated from the Dominican Republic to the Washington Heights section of Manhattan. He joined the Red Sox in 2001, after spending the first part of his career with the Cleveland Indians (1993-2000). From 1993 to 2000 Ramírez collected 236 home runs and 804 RBI in 967 games for the Cleveland Indians, including a career-high 45 home runs in 1998, and a career-high 165 RBI in 1999, when he hit .333 with 44 homers and scored 131 runs (also a career-high). His 165 RBI in 1999 was the highest total by any player since Jimmie Foxx (1938). His 1999 season was all the more impressive, since he played in just 147 games. During his time in Cleveland he played in two World Series. In the summer of 2003, after missing several games with pharyngitis, Ramírez was criticized by the Boston sports media and many fans. When it became public that he was spotted in a bar (in the same hotel where Ramirez lives) with a close friend, Yankees infielder Enrique Wilson when Ramirez was supposedly too ill to play, the controversy grew, causing Boston manager Grady Little to bench Ramírez for one game. Despite his strong play in the 2003 post-season, Ramírez's Red Sox lost in heartbreaking fashion to the Yankees in a seven game showdown in the ALCS. The new Red Sox ownership and management, trying to rid themselves of his massive contract, put Ramirez on irrevocable waivers, thus making him available to any team willing to assume the remainder of his contract. However, all 29 other teams passed on the opportunity to claim Ramirez. Below are stats for three of Manny's most productive years. For his career stats, click here. 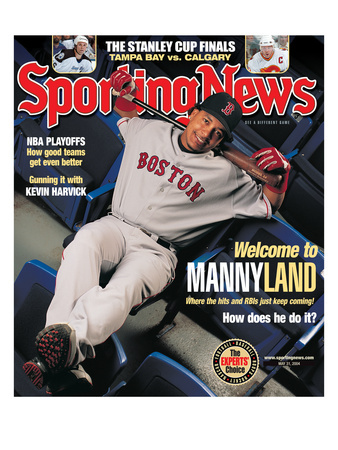 Featured here are Manny Ramirez posters, photos, giant collectibles and apparel.